With the massive influx of entertainers letting their political ambitions known to serve their people in different capacities come 2015 general elections, nothing seems like a surprise anymore. Top entertainers like 9ice, Kate Henshaw, KSB, Tony Tetuila, Desmond Elliot and others have all made their intentions public. 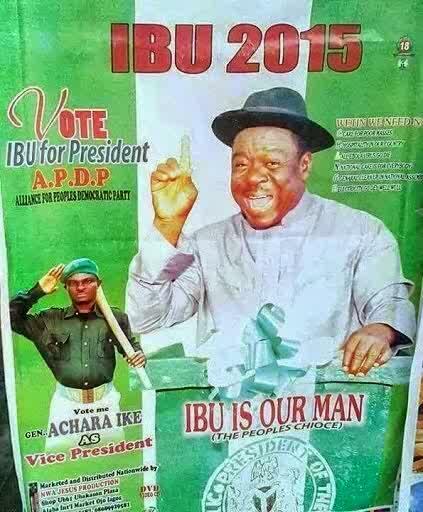 Just recently a funny flier of comic actor, Mr Ibu born as John Okafor has also flooded the Internet. As hilarious as it comes, the comic actor wants a presidential ticket for 2015, but on a party that doesn’t exist in the country right now. Reps seek repair of Nigeria House in U.S.. He may become our next president,maybe d youth wil be empowered 2ru him.we shuldn’t luk dwn on him he just make his intensions knwn.